- HOME DECOR: This macrame plant hanger excellent quality, adds the perfect touch to your room and living room.ideal for display your beautiful plant, vases, books, or decorations. Creates lovely, modern shaped boho home decor. 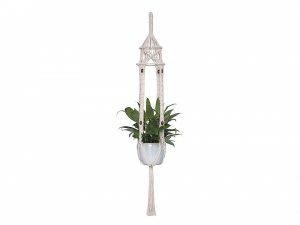 - SAVE SPACES: This macrame hanging plants planter makes a wonderful gift for housewarmings, weddings, and all occasions.You save on shelf space and can beautify any indoor / outdoor corner spaces. - STYLE: Versatile style macrame plant hanger that can hanging in the ceiling, suitable for decorate your home and garden.Simple and modern style, make your life become unique. - MATERIAL: Made of cotton cord, strong and durable cotton plant hanger.No plant or flower pot included in this item! - SIZE: This macrame hanging shelf is approximately 50" in height including the tassel.In the picture 1, the flower pot shown is 7.5" in diameter,6.3" in height.